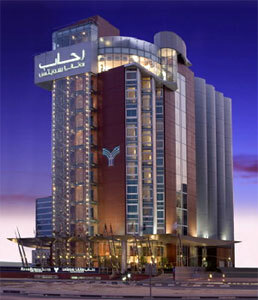 Rihab Rotana Dubai - Dubai Hotel Located in Dubai City Centre, Dubai Shopping Area and Dubai Business District! The Rihab Rotana - Dubai offers luxury and great facilities right in the heart of Dubai. The hotel is 2 km (1.2 miles) from Dubai International Airport and 3 km (1.8 miles) from World Trade Center and Creek Golf & Yacht Club. Relax in the 24-hour lobby restaurant where you can enjoy a wide variety of drinks, tea, coffee and delicious light dishes. The Moka Cafe offers an extensive buffet for breakfast and a varied a la carte menu for lunch and dinner. The hotel has a long list of facilities and services such as limousine rental, a daily shuttle service to the Mercato shopping mall, a gym, an outdoor swimming pool, and fully-equipped meeting rooms with the latest audiovisual equipment. The hotel has its own parking facilities, free of charge, in a secured garage.